Photographers Resource is 10 years in the making and as the name suggests, was originally a website developed to provide a wide range of information for photographers. Over the years it has become a popular resource for people with all different types of interests, particularly in the UK, which is what most of our content covers, for those who enjoy going out, visiting places or seeing all types of places and events. 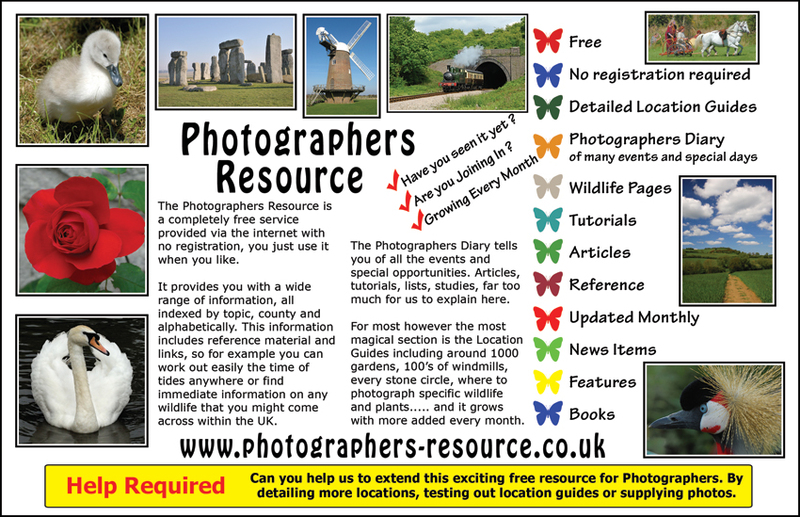 Photographers Resource also has a range of specialist sections covering a range of topics, including heritage, nature and wildlife found in the UK, walks, islands, lighthouse and coast line and photography 'how to's. Much of what is covered here is in more detail than anything available elsewhere. Many of our location guides, on places to visit around UK, have detailed explanations of what you are likely to see on your visit as well as many photographs. Our picture galleries have many pages devoted to some of the places we have visited. Unlike a printed magazine, that runs for a week or month, we don't have a space limit so we produce large indexes of the places and information introduced in Photographers Resource, this makes it always available, and is updated and fully indexed in a range of ways. All the information provided is free and there is no registration required to use it. and if you like, also help to expand it. See also the Sections tab in the left bar at the main Photographers Resource page. Location guides, with details, grids, links etc, all indexed by topic, alphabetically and by county. Galleries with collections of pictures. Route Guides and other specialist pages. Lists by topic often within a county, allowing you to find so much more to see. A monthly diary to tell you about a very large number of events, and activities that are on, that you might like to visit or photograph. A reference section with everything from mapping and weather to comparison information. A number of articles, covering topics to photograph, photographic techniques and more. The web address to go directly to the current update page is www.photographers-resource.co.uk/nl why not add this to your browser favourites. We also have doorways that allow direct access to sections of the information for those with specific interests. These are shown in a panel at the top of this page. Webmasters - you can link to individual pages if you wish. This system is designed to run with or without the frame set. To access the pages without the frame sets and get direct HTML addresses of pages use non frame indexing. At the top of each page a bar like the one below allows you access to the full Photographers Resource website if you landed on a page outside our frame system.